Favorite locks of choice at residential and commercial properties, deadbolt locks have witnessed a surge in popularity in recent times owing to the added security they offer. A few lock variants can give away to force or open up easily to lock picking or by using credit cards to slide the bolt up. However, a deadbolt lock is all about resisting such attempts, and has long remained a standard security component in several properties. So, when you lose the key, or your lock malfunctions, there’s absolutely no way you can regain entry – except with professional help. The unpredictability of an emergency makes it inevitable for a locksmith to operate 24/7 to render services to customers in need. If you happen to live in Akron, OH area, luckily, you don’t have to look anywhere else for an emergency locksmith, when you have Akron Locksmith Service. A prominent name in the industry, we’ve built a stellar reputation for our quick, reliable and affordable services. 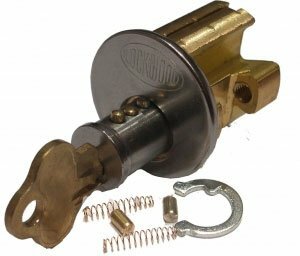 Deadbolt locks respond to only their specific set of keys. If you’ve lost the only set you had and are now contemplating replacing the entire lock, talk to our experts first. Our technicians are adept at crafting keys without requiring an existing model key. We’ll take a look at your deadbolt and use the state-of-the-art tools loaded up in our mobile vans to develop a new set, on-location. If your key breaks in the deadbolt lock , there’s little you can do! With the broken parts lodged tightly within the lock and the only key you had now snapped in pieces, what you require is professional key extraction services. We have specialized extractor tools to remove the pieces without afflicting the slightest damage to your lock. Once we’re through, we make new keys or carry out repairs, if needed. Our services are available 24/7 in and around Akron. Dial 330-265-2229 for immediate assistance!